Recently, the minnies and I visited the Baltimore Museum of Art. It's truly a hidden gem in Charm City. Away from the traffic of the Inner Harbor area, the Baltimore Museum of Art has ample parking and offers easy access from many major highways. The collection is extraordinary and you could easily spend days exploring all of the treasures. Going to a museum is always an adventure for us. We always have a goal of finding art from each continent, except Antarctica, obviously. After we visit a museum, the minnies and I talk about our favorite part of the visit. This was the first time that we all agreed on a favorite. Do you spy the Monet painting of the Thames River in the background? All of my favorites are here including Matisse, Monet, and Degas. Alexia really loves work from Miro. You're never to young to visit a museum. My minnies have been visiting museums since they were born. There's plenty to keep little ones busy at the BMA. We listened to the Family Audio Tour with interesting interpretations of thirty different works of art. The museum also offers Costume Kits! Alexia decided to wear this costume of a Spanish Infanta. 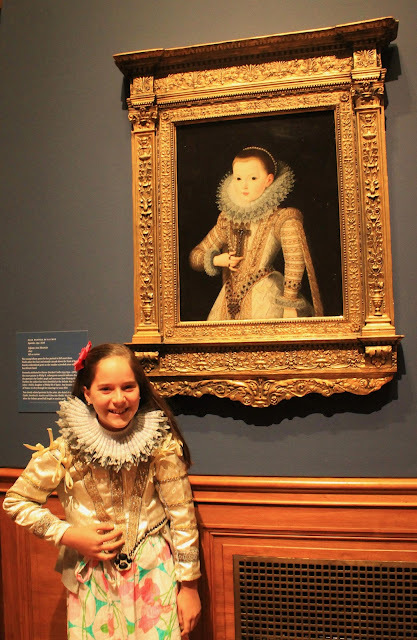 She decided that between learning five languages and wearing a lace collar, being a Spanish princess was hard work. 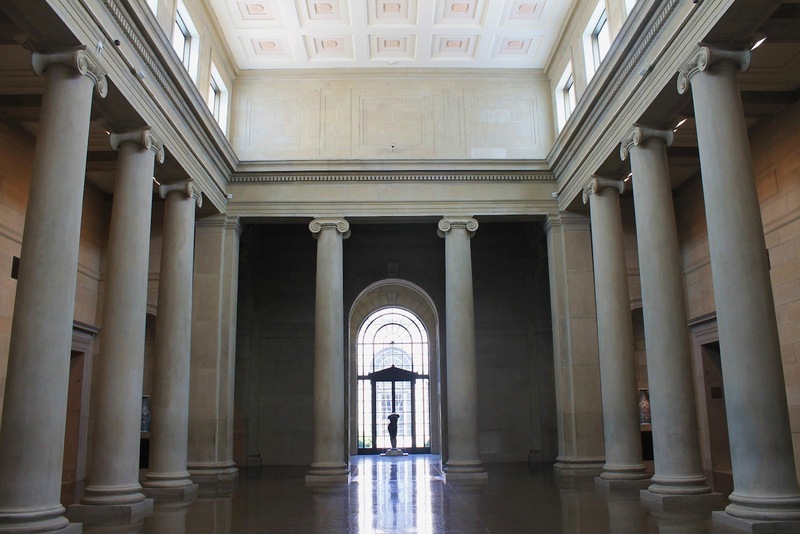 The corridors and courtyards of the museum offer glimpses of beautiful architectural design. I also loved the different period rooms. The beautifully landscaped Sculpture Gardens add to the collection and offer a verdant refuge in the city. Hibiscus flowers and lush greens line the shaded walkways of the gardens. Several people noticed how the girls and I "matched." The funny thing is, we didn't match. At all. Completely different prints. Alexia is wearing a women's Avery skirt and Natalia is wearing a minnies' skirt and women's Vera shrug. They're officially in the tween stage. No trip is complete without a visit to the Museum Gift Shop. 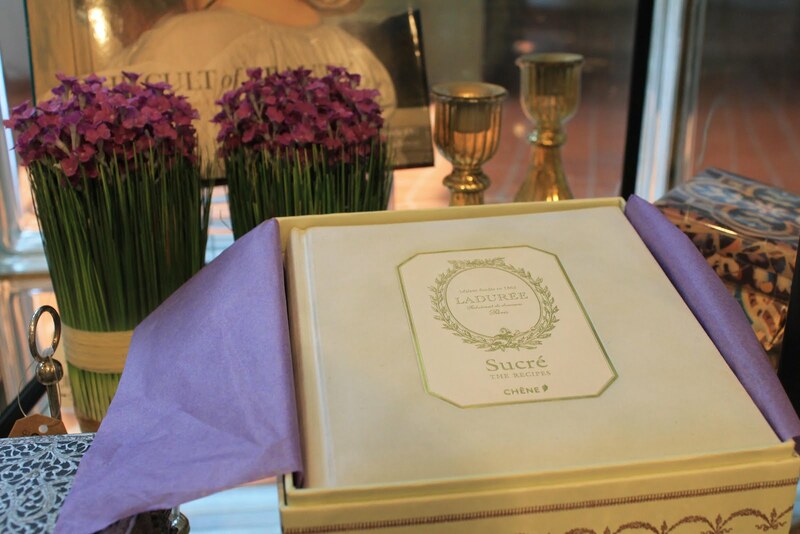 Look at this fabulous recipe book from Laduree. Wouldn't it make a lovely gift? We took a break to enjoy lunch at Gertrude's Restaurant. Gertrude's at the Baltimore Museum of Art is the restaurant of cookbook author and cooking show host, John Shields. The menu offers Chesapeake cuisine, including Crab Imperial, Single-Fry Oysters, Rockfish, PanFried Chicken, Corn Fritters, Crab Soup, and of course, Maryland Crab Cakes. 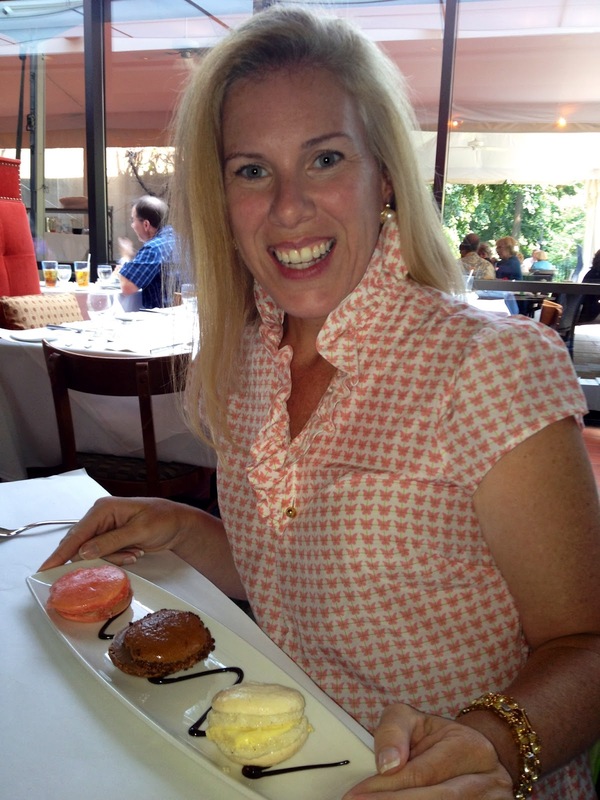 Although I love my Maryland cuisine, the highlight of my meal was dessert. I highly recommend the Neapolitan Ice Cream Macarons. Delish. What do you like to do on a day at the museum? The BMA is one of my favorite places to visit and Gertrude's is always delicious! The Impressionists are by far my favorites as well. Have you ever visited Giverny? It is truly an amazing experience! I love that little Degas dancer. I have seen her in so many museums around the world and she always made me smile. Whenever I saw her, I would always have to pose just like her. I'm going to have to check out the museum next time I'm in Baltimore! How fun to try on costumes! 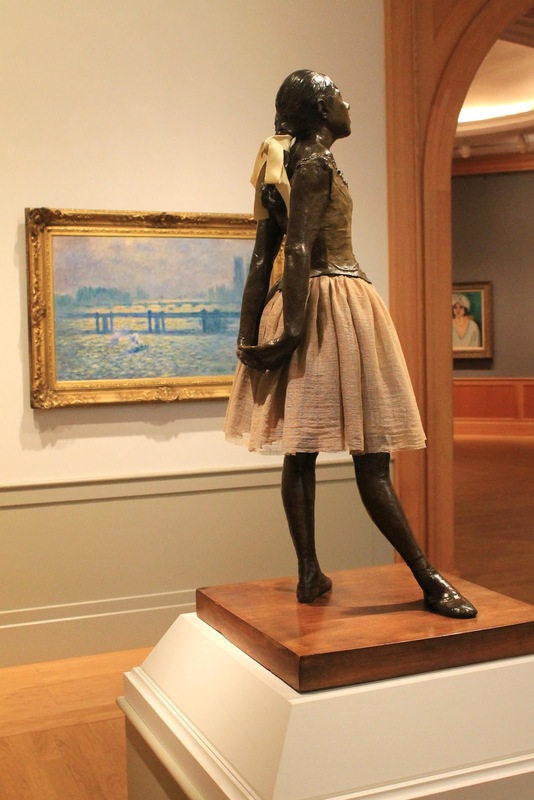 I love that Degas ballerina!